It could just be a matter of taste – I’m more interested in what the doc world’s Banksys are doing than the calcified style of a guy like Burns – yet nonetheless, hard as I try I can’t get through his films. Minutes into the credits I find myself lulled to sleep by predictably timed cuts and Peter Coyote’s soothing yet muzak-like narration. Which also makes me wonder if that’s Burns’ appeal. None other than Burns buddy Herzog claims to have binge-watched The Vietnam War – but is that because it’s merely a multipart popcorn flick? One in which Burns’ mostly liberal-leaning, passive audience gets to zone out without being challenged to critically think, while simultaneously patting itself on the collective back for consuming (spoon-fed) “important” journalistic work? 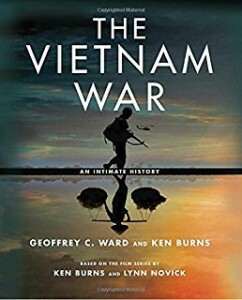 Indeed, even the earworm, period-heavy soundtrack of The Vietnam War comes across as manipulative, uneasily lulling us into the “romance” of battle and the heroism of those who fought. At least Herzog (and Errol Morris, for that matter) are transparent about their acts of manipulation, eschewing any pretense of “historical fact.” Burns, on the other hand, creates films for the populist masses, convincing himself and his viewers that his crafty camerawork and, as Fox News might say, “fair and balanced” POV story reveals some sort of “truth.” When the reality is that Burns is simply a nonfiction magician, and a stale icon of easy surface filmmaking masquerading as deep inquiry.